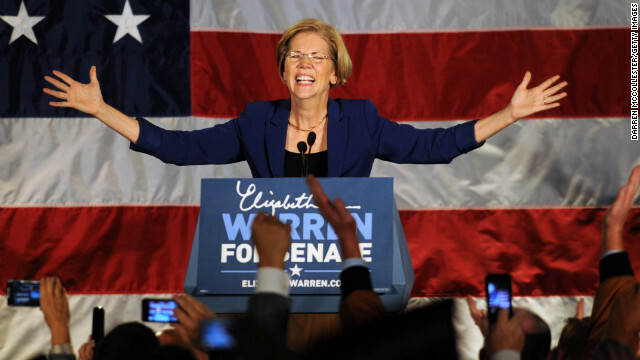 Voters in Massachusetts voted Elizabeth Warren to the U.S. Senate. Editor's note: Hanna Rosin is the author of the new book, "The End of Men: And the Rise of Women." She is co-founder of Slate's DoubleX, a web magazine about women issues. (CNN) - I almost always get asked the same question: How can it possibly be the "end of men" when there are so few female elected officials - when men still hold the reins of political power? It's an excellent question. Until now, I've answered by pointing to statistical trends and future projections. Always, I ask people to take a leap of faith. But after this election, I feel like I am on so much more solid ground. The women's vote did not turn out to be historic in the way pundits predicted before the election. Yes, more women voted for President Obama, but not in record numbers. The gender gap was in fact a little smaller in this election than in 2008. Yes, women were important in certain states, but so were young people, African-Americans and Latinos, who, together, make up Obama's new winning coalition. What's more, women did not even constitute a unified vote. Married women tended to vote for Romney, while single women went for Obama. After getting re elected I'll go to New York and Jersey and ask companies like Walmart Kmart BJ's Costcos and Sams to donate blankets socks water water dry foods and canned goods. I would also ask the surrounding states how to open up shelters to the elderly and open hospitals for emergency cases such as pregnancy dialysis and other severe cases. Also I would get with Congress and ask for a mandatory blank check for the victims of Hurricane Sandy and the snow storm. Also put into play a budget for those such as clean up men electricians and plumbers to be compensated for their time effort and energy. This would be the first step in showing that the government is for the people and that congress can finally get something done. Also it will show the world that the US cares about its people first and will always come together in times of need.This is good for foreign policy and homeland security. I would speak briefly in the rose garden at the white house and declare these things on Friday or Monday no later than Tuesday of next week.